Mario de Miranda Quintana (July 30, 1906—May 5, 1994), was a Brazilian writer, poet and translator. Born in Alegrete, state of Rio Grande do Sul. He was considered a poet of simple things, with a style marked by irony, profundity and technical perfection. He worked as a journalist almost all his life and translated more than one-hundred and thirty works. These literary works include In Search of Lost Time by Marcel Proust, Mrs. Dalloway by Virginia Woolf, and Words and Blood by Giovanni Papini. I was born in Alegrete, on the 30th of July of 1906. I believe that was the first thing that happened to me. And now they have asked me to speak of myself. Well! I always thought that every confession that wasn’t altered by art is indecent. My life is in my poems, my poems are myself, never have I written a comma that wasn’t a confession. Ah! but what they want are details, rawness, gossip…Here we go! I am 78 years old, but without age. Of ages, there are only two: either you are alive or dead. In the latter case, it is too old, because what was promised to us was Eternity. I prefer to cite the opinion of others about me. They say I am modest. On the contrary, I am so proud that I think I never reached the height of my writing. Because poetry is insatisfaction, an affliction of self-elevation. A satisfied poet doesn’t satisfy. They say I am timid. Nothing of the sort! I am very quiet, introspective. I don’t know why they subject the introverts to treatment. Only for not being as annoying at the rest? It’s exactly for detesting annoyingness, the lengthiness, that I love synthesis. Another element of poetry is the search for the form (not of the form), the dosage of words. Perhaps what contributes to my safety is the fact that I have been a practitioner of pharmacy for five years. Note that the same happened with Carlos Drummond de Andrade, Alberto de Oliveira, Erico Verissimo – they well know (or knew) what a loving fight with words means. 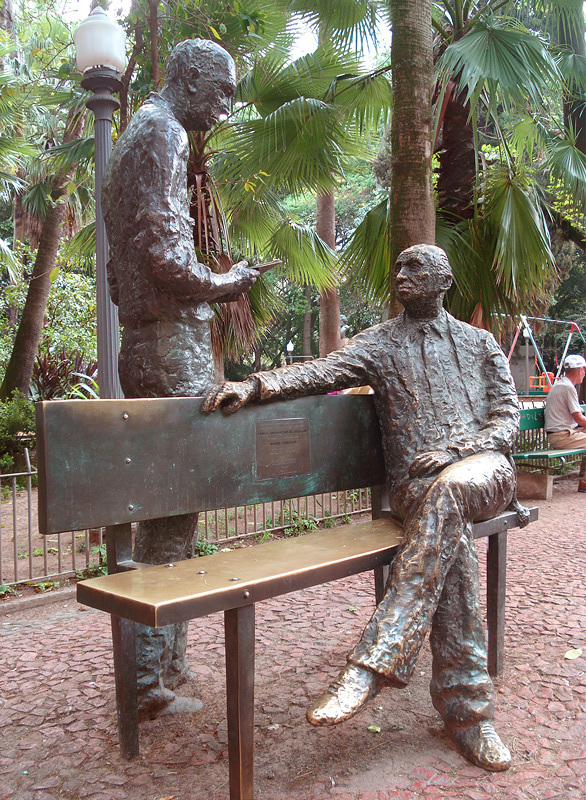 In the Praça da Alfândega in Porto Alegre, capital of Rio Grande do Sul, one can find a sculpture with Carlos Drummond de Andrade (standing) and Mario Quintana. There is something similar of Andrade alone in Ipanema. This entry was posted in Literature, Notable People and tagged brazilian writer, mario quintana, poet, rio grande do sul, translator, um dia. Bookmark the permalink. He has a face like I’d imagine Francis of Assisi to look like. Love this blog! Sure, no prob. I couldn’t find a translation so I did it myself. Life is the duty that we brought home to do. When one looks, it’s already 6 o’clock! When one looks, it’s already Friday! When one looks, we lose the love of our life. When one looks, 50 years have gone by! If I were to be given one day, another opportunity, I wouldn’t look at the clock. And there’s more: do not stop doing something that you like due to a lack of time. Do not stop having people at your side just because you are afraid of being happy. The only thing missing will be this time which, unfortunately, will never return. sixty years have gone by! I wouldn’t even look at a clock. Thank you for posting something about Quintana. I live inthe city he lived almost his hole life, porto alegre. Thanks! Loved to read something about Brazilian poet Mario Quintana! Thanks a lot! I love his poems and wisdom! These are beautiful translations. Do you know of any translation of “O velho e o espelho”? that poem really touched me. Thanks for the compliments. I didn’t do much searching but I was up for the translation, so I did it myself. Cheers! By chance, I surprise myself in the mirror: who is this? That looks at me and is so much older than I? My elderly father – that already died! How could we end up like this? And your plans ultimately ended up in the ground. Hey guys! can some of you translate this litlle part of a Quintana’s poem for me please!? “E que fique muito mal explicado. “And may it be very badly explained. I make no effort to be understood. In a military sense, ‘sentido’ refers to saluting. The phrasing “quem _____ é _____” is well-known in Brazil though the action and the noun are able to be altered. Consider another phrase “quem nada é peixe” (those who swim are fish) given as a response to someone who might say they are doing “nada” (nothing). If someone were to say “não faz sentido” (it doesn’t make sense), a cheeky response would be “quem faz sentido é soldado”. A person salutes when they are given an order, no matter if they are ignorant of the reasoning behind it or the action required of it (usually killing). hi! how translate this little one? Calmly look at their heart, and study it. Into your lovely and subtle amusement.